I used to do short term contracts for English Nature before I came to the Yorkshire Dales National Park Authority. I was doing estate work on the nature reserve, so things like walling repairs, fencing repairs, thistle control, ragwort control. I was always up on Ingleborough, so I kept seeing this view of Whernside. Whernside from most angles isn’t particularly spectacular. From the north it’s just like a big lump, but as you go up Ingleborough it starts to take on a bit of a character. And as you come further round onto the summit, that view twists again and it looks like a bit of a peak. It’s a false impression: you’re actually looking along the edge of that scar where it falls away. So it’s not the actual peak you’re looking at but it gives the impression of it. This view of Whernside reminds me of a gentle swell coming into a beach, just before it starts to rise and turn. I can almost imagine it moving, which is quite a strange thing for a hill, but in my mind that’s how it’s got most character. It’s taken from High Lot – a large allotment that belongs to Natural England. 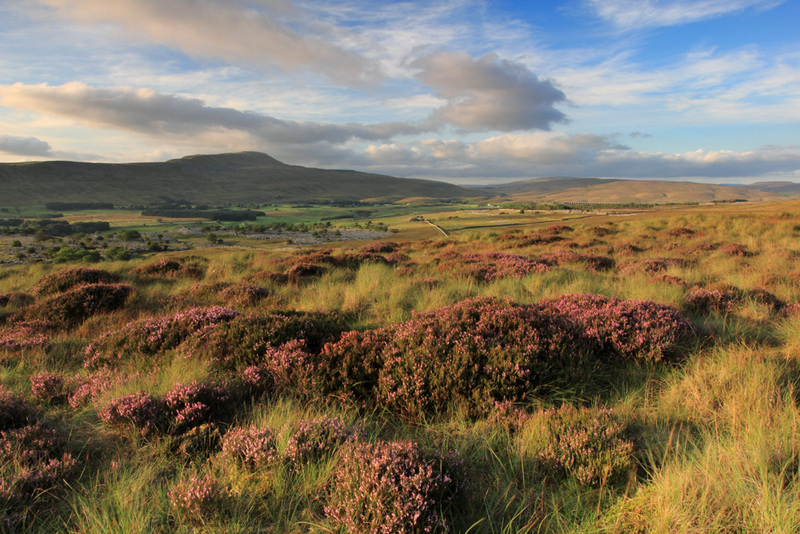 It’s allotted land, and a lot of Ingleborough is common land as well. Ingleborough Common is split into two, between Ingleton and Clapham – there are Ingleton graziers and there are Clapham graziers, and they each have rights to graze so many sheep and cattle over the course of a year. A lot of this area has been overgrazed, subsequent to the Second World War, but heather’s starting to come back now the grazing’s under management. This field used to be quite rough grassland, but now there are these little patches of heather; it sort of breaks it up. The path runs just to the left of here. It’s part of the Three Peaks network. 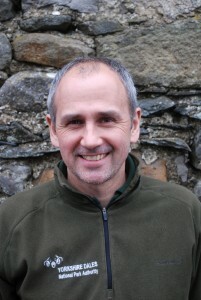 As well as Area Ranger, I’m Project Manager for the Three Peaks Project. It’s the second project of that name. The first one was in the 1980s and ‘90s; that was about doing a lot of path construction and habitat restoration work to provide some sort of sustainable network. It was the worst network in the UK at that time. With this peat, when it gets worn it gets really soft, and then water gets in it and scours it, so people walk off to the side, and it just gets worse and worse, and paths get wider and wider. Lots of work was done building paths, so people had something decent to walk on, and by building paths it allowed the surrounding vegetation to recover. In 2008 we started looking at a second project to raise money to get another person to do maintenance work, to make the network sustainable. So we look at engaging with people who come and use the area, to try and encourage them to help us look after it, essentially through some sort of donation or giving. As Area Ranger, a third of my time is woodlands and species; a third of my time is communities – which could be anything from speaking to a local councillor, a farmer, a WI group; a third of my time is access; and then a third of my time is the Three Peaks Project! It’s very varied, very satisfying.